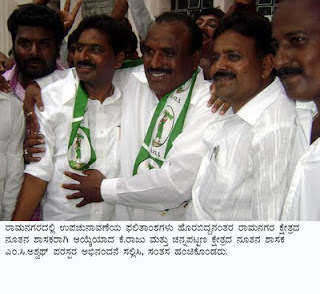 Ramanagara District: Ramanagara Assembly Constituency Bye-election: JDS makes it again. Ramanagara Assembly Constituency Bye-election: JDS makes it again. Mr. K.Raju is the new MLA of Ramanagara Assembly Constituency. Bye-election was held to this constituency on August 18th consequent to the resignation of Mr. H.D.Kumara Swamy who won the Loksabha polls recently. He had contested the election on JDS ticket. 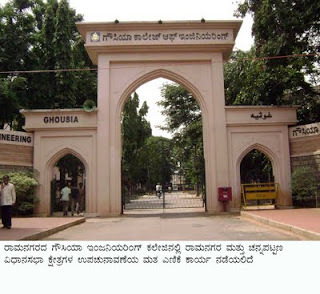 The counting of votes took place today (August 21,2009) at Ghousia Engineering College, here. The counting began at 8 am and concluded by 11.30 am. The constituency went to polls with Electronic Voting Machines which made the counting easier and the announcement earlier. By the bye election results it is proved again that Ramanagara is the JDS fort. The dismal performance of BJP the party being in power in the Karnataka is because it neglected the ongoing development works. However the Congress has improved its performance. Number of votes the candidates got: K.Raju- Janata Dal (secular) 60743, C.M.Lingappa-Congress 38728, Narayana Gowda-BJP 18556. Bye-elections for the neighbouring Channapatna Constituency was also held on Aug.18 consequent to the resignation of the sitting MLA Mr.C.P.Yogeshwar. He quit congress and joined BJP and faced the bye-election but he failed to win. JDS candidate M.C.Aswath won the polls and he is the new MLA of Channapatna constituency. Nice brief and this mail helped me alot in my college assignement. Gratefulness you for your information.